Available in Europe from 2019 exclusively on John Deere’s ZTrak 900 Series commercial zero-turn rotary mowers, the new Michelin X Tweel Turf airless radial tyre means customers may never need to buy rear tyres for their zero-turn mowers again. Unlike traditional pneumatic tyres, the Michelin X Tweel Turf virtually eliminates tyre downtime and is nearly maintenance free. A new Z994R model equipped with X Tweel Turf tyres makes its UK & Ireland show debut on the John Deere stand (E080) at SALTEX 2018 at the NEC, Birmingham in November, alongside the company’s latest compact tractor and lawn tractor developments. Offering a combination of operator comfort, productivity and a high-quality finish, the Z994R is designed to cater for customers looking for a more compact solution to working in restricted spaces. It features a powerful 25hp (18.4kW) diesel engine together with a heavy-duty frame and a belt-driven deck for optimum power efficiency. High output is further achieved by the 137cm (54in) 7-Iron PRO side-discharge rotary mower deck. These options include the exciting new Michelin X Tweel Turf tyre, which avoids downtime from punctures when compared to traditional pneumatic tyres. It has the same dimensions and bolt pattern as a standard tyre, but features automotive rubber technology that allows the tread to last up to three times longer. 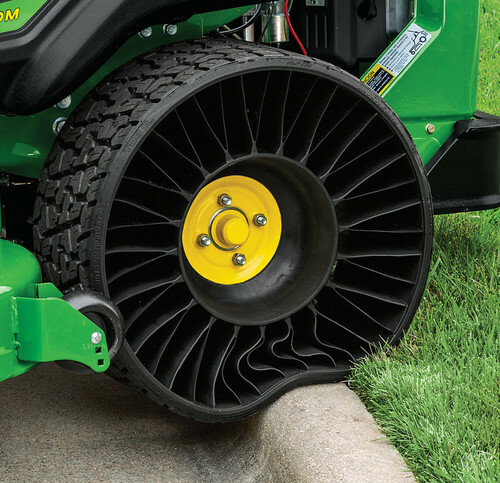 The Tweel also reduces ground compaction and increases ride quality, which is enhanced by the mower’s new ComfortGlide seat. Using pioneering technology first introduced by John Deere on its agricultural tractors and other self-propelled equipment in 2001, a top of the range 4066R compact tractor can also be seen for the first time equipped with a StarFire satellite receiver and AutoTrac Universal automatic steering system. This is now being made available on the company’s compact tractor range to help operators achieve higher levels of accuracy and input cost savings when working with implements such as amenity turf sprayers and spreaders. An enhanced range of high-capacity commercial mower decks has also been announced for the popular John Deere X940 Series diesel lawn tractors. These are designed to increase performance and further improve operator convenience. The robust construction of these decks, which are stamped from a single steel plate, ensures that they are built to last and serve the needs of demanding commercial operators. Available with cutting widths of 137 or 152cm (54 or 60in), the decks are uniquely designed to handle high volumes of material. Upgrades have been made to the drive-over ramps for even easier connection of the mower deck to the tractor. In addition, the X940 Series now comes as standard with a new deluxe seat featuring adjustable back support, with an air ride suspension seat available as an option. Both seats are now fitted with armrests. The existing MulchControl feature, which allows simple changes between grass discharge and mulching, has also been enhanced by the addition of an optional hydraulic actuator known as One-Touch. This increases the speed of changing between modes for increased uptime and ease of operation. All these new products will be available at John Deere dealerships in the UK and Ireland from spring 2019.